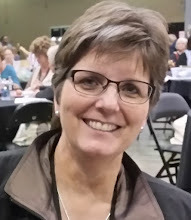 Susan's Craft Room: Online Extravaganza Begins TODAY! NOTE: If you order $150 or more, do not use the code. You will earn Host Rewards! FREE STUFF! 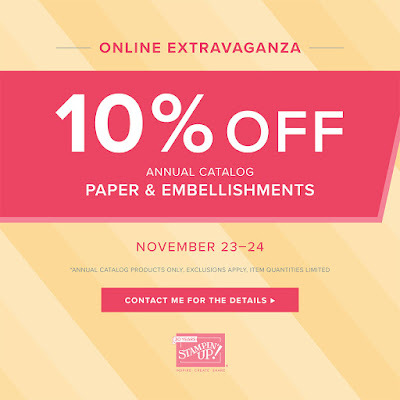 Shop during the Online Extravaganza sale and you'll enjoy deals on your favorite crafting needs and you'll avoid all the mall craziness. Deals start November 23 (Black Friday) through November 28. Online Extravaganza will run for six days. 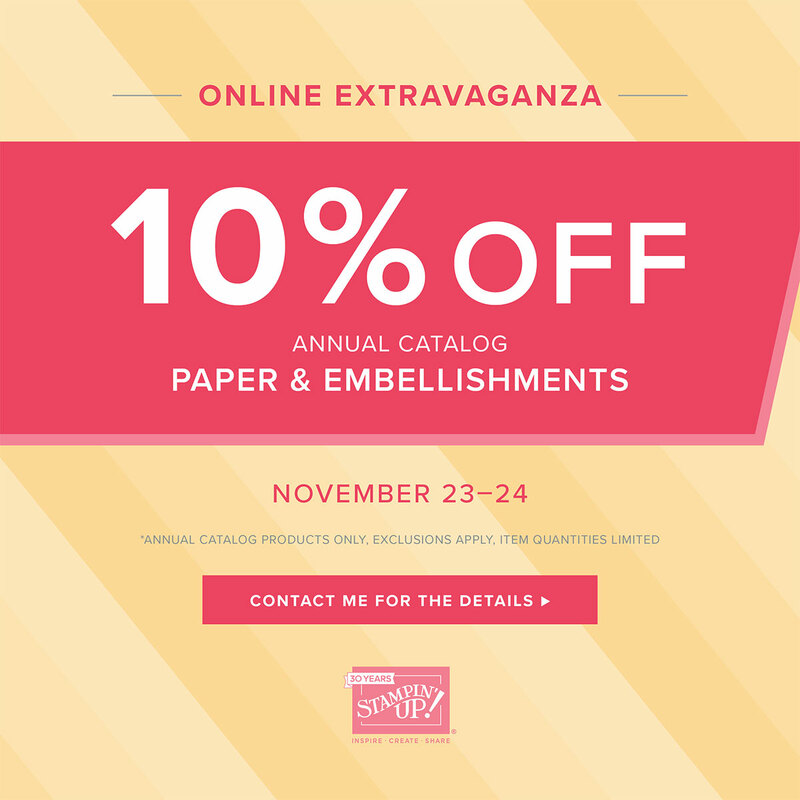 During this time, we'll be throwing three, 48-hour sales featuring a selection of products from the 2018–2019 annual catalog—all at 10% off! Each 48-hour sale will feature two product categories (e.g., paper, stamps, ink, etc.). When one sale ends, the next sale begins; this cycle will continue until Online Extravaganza is over. By the end, nearly every item from the annual catalog will have been on sale! Click here to see a list of the items that are excluded from the sales. The majority of the items excluded are Paper Pumpkin kits, bundles and the "You Can Make It" kits. Online Extravaganza will run for six days. 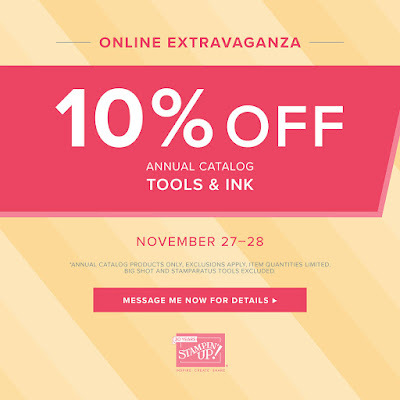 During this time, we’ll be throwing three, 48-hour sales featuring a selection of products from the 2018–2019 annual catalog —all at 10% off! 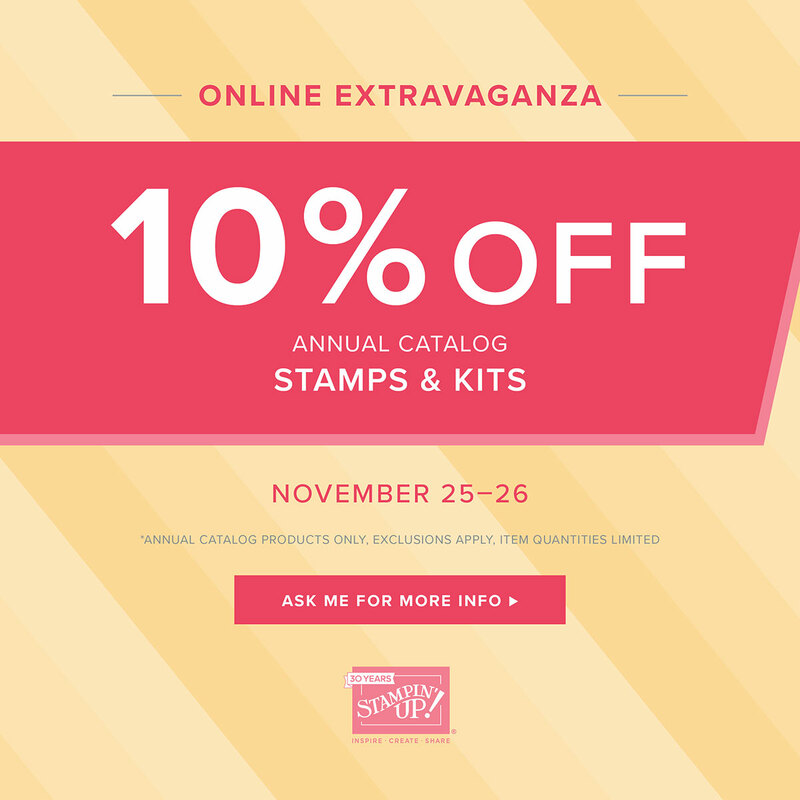 Each 48-hour sale will feature two product categories (e.g., paper, stamps, ink, etc.). When one sale ends, the next sale begins; this cycle will continue until Online Extravaganza is over. By the end, nearly every item from the annual catalog will have been on sale! Below is information on products in each of the 3 sales. Each sale ends at 11:50 (mountain time) the last night of the sale. The next sale begins at midnight (mountain time).